After the ironing I decided I’d make a gym bag for her plimsoles, after all something homemade would stand out among the sea of generic gym bags available. 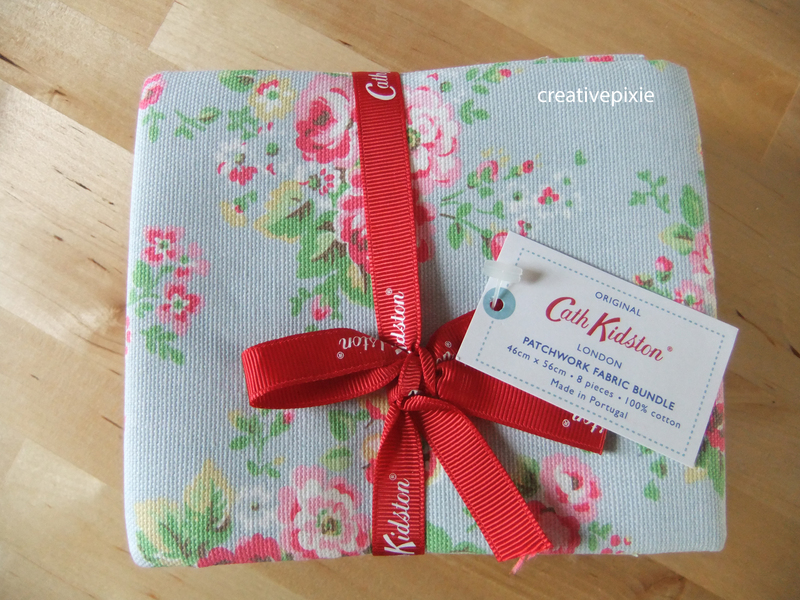 I remembered my lovely husband had treated me to a lovely bundle of cotton duck Cath Kidston fabric a several months back. 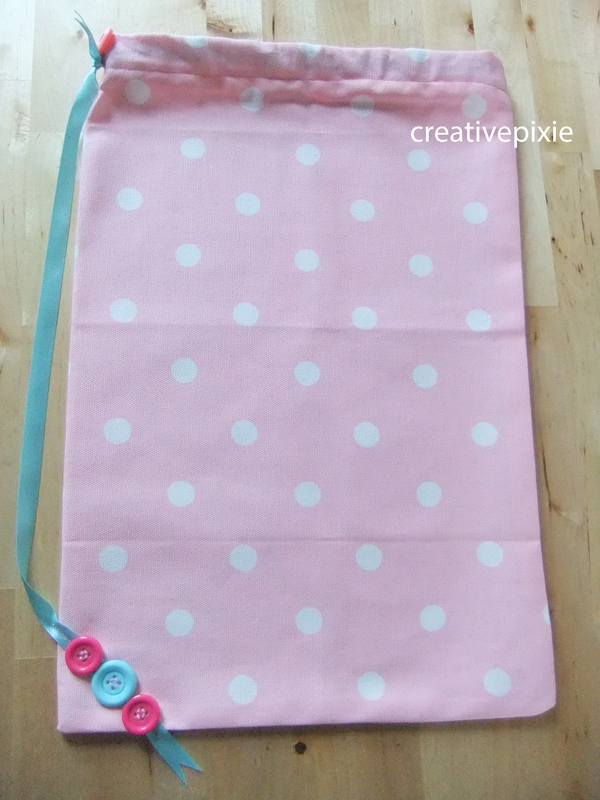 I have a few projects in mind for it, the gym bag being one, a peg bag being another. Anyway as you can see the pack contained floral, stripes, stars and spotty prints. 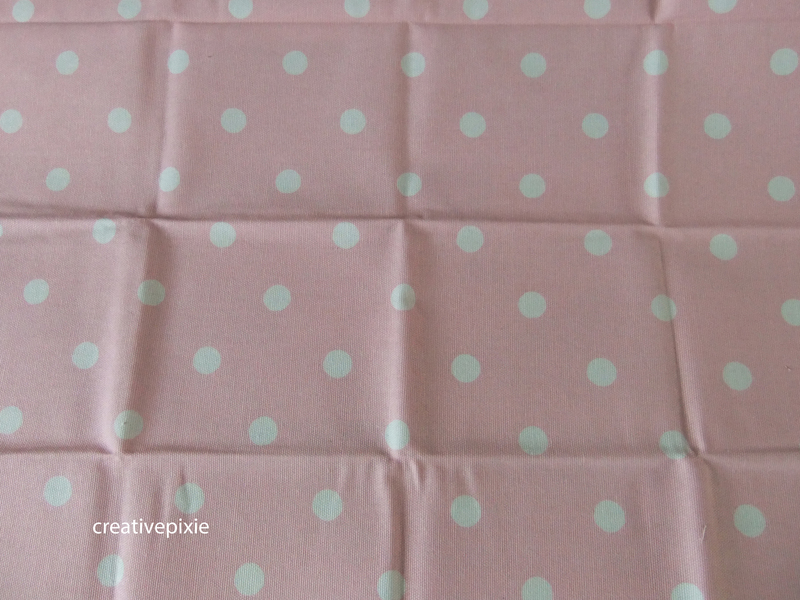 I decided to use the pink spotty print after all what 4 year old girl doesn’t like pink. So out came the sewing machine and the design? I just made it up as I went along. 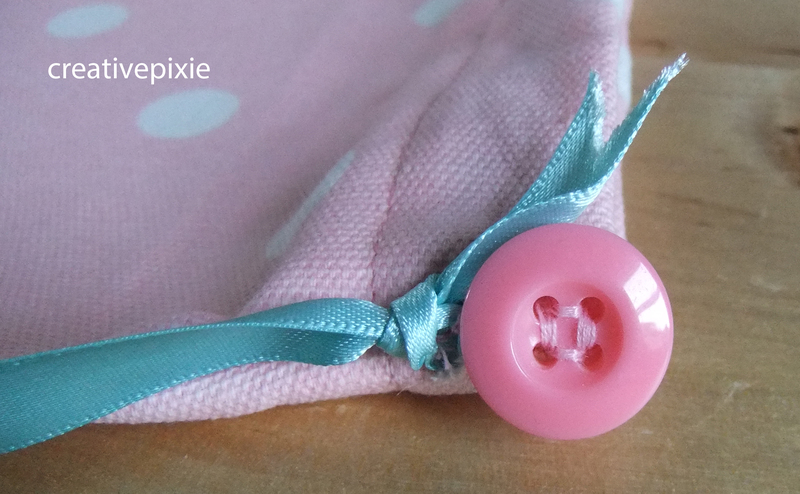 I decided to use some blue ribbon as the drawstring and some buttons from my stash as embellishments. 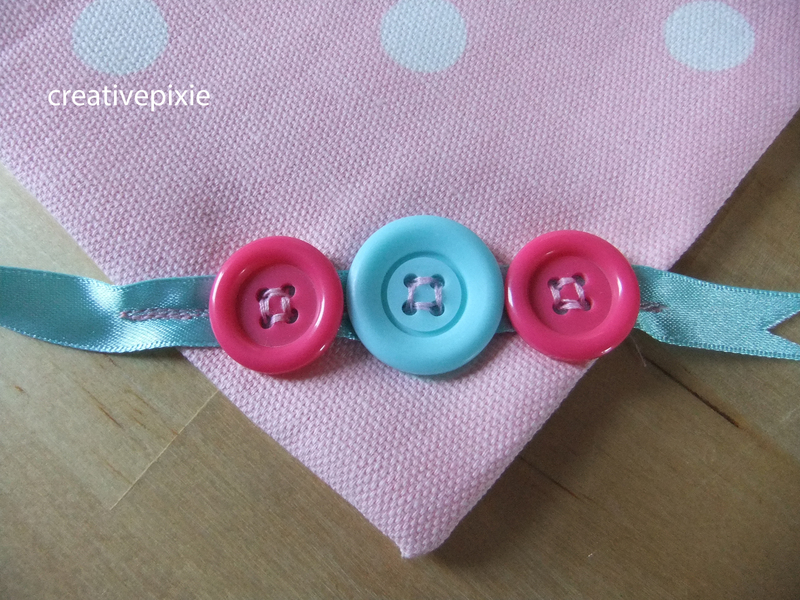 I also added a button at the top to add a bit of security to the holes the ribbon is fed through. I joined the ribbon by sewing the two ends together then tying a knot in it before I cut a V in the end off the ribbon to stop it from fraying. 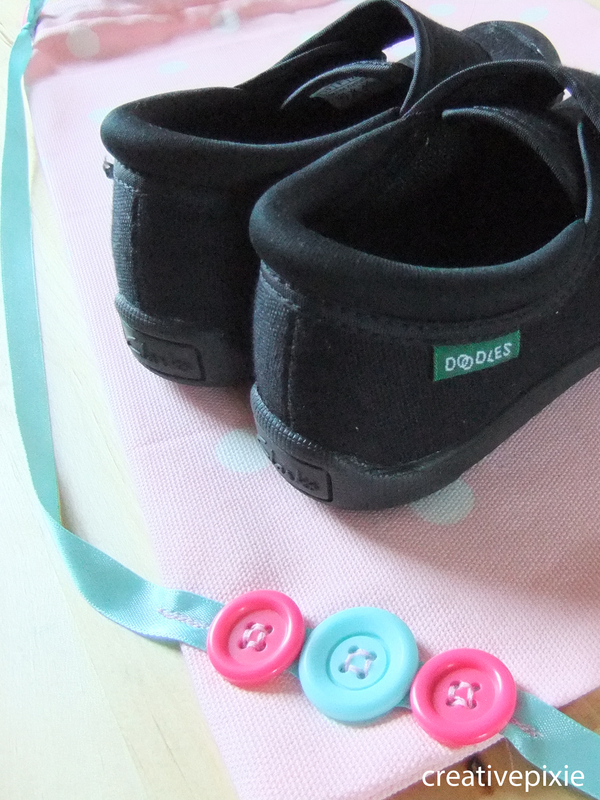 So the finished bag was ready for the plimsoles. Then hung up on the door handle ready to go to big school with its owner. Wow, this is so pretty – I love it!! Thank you, button stashes are useful for something. Lovely. I will be spending the next few evenings attaching labels too. Little J starts in Reception (he is almost 5) this week. Don’t think a pink spotty gym bag would go down very well with him though! I bet all the little girls wish they had one just like it! I love it! It’s so pretty. It’s great that she’ll have a completely unique bag, so hopefully there will be no taking home someone else’s bag by mistake. That was my thinking. It’s funny cause I remember my Mum making me one out of a curtain remnant when I started school. Lovely idea and lovely bag!!! Thank you. My button stash came in handy for that. What to make next ummm? a button picture or cushion? 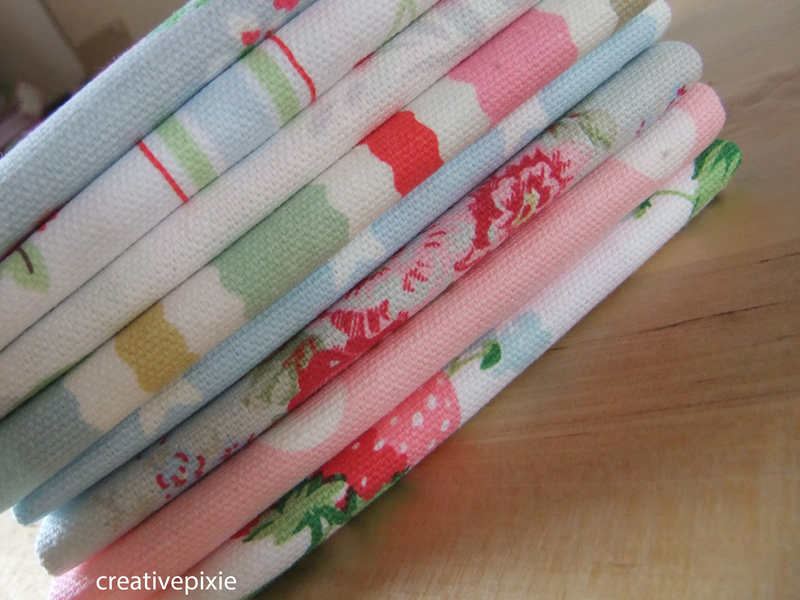 I have a plan for a little crafting this weekend-all shall be revealed soon. It’s great to see you back Jeannie, I’ve missed your inspiration. 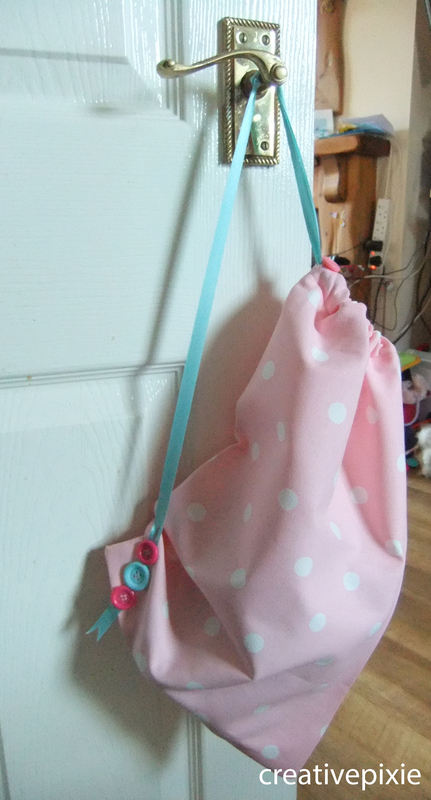 This bag looks too cute for shoes! Aww thank you so much. It’s good to be back, I’m enjoying sharing what I make and if others are inspired to make something that’s lovely. Love the craft!